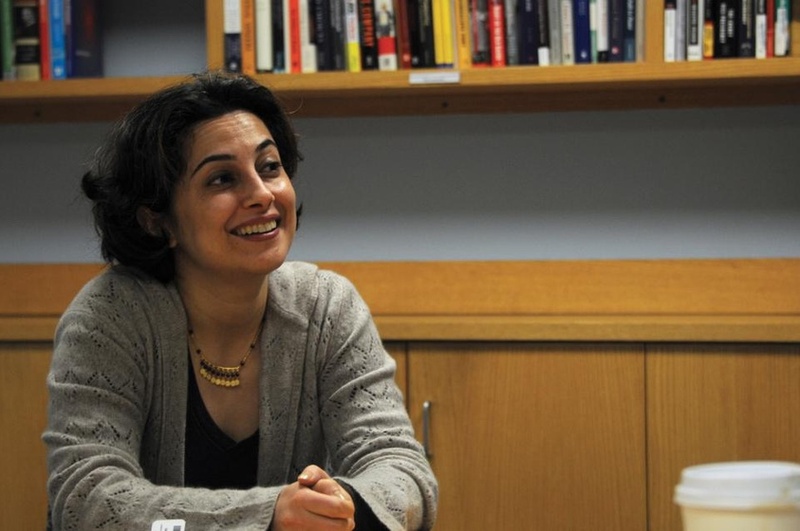 Born and raised in Tehran, Nazila Fathi is a Shorenstein Fellow at the Harvard Kennedy School. Before comingto Harvard, she worked in Iran as a journalist for The New York Times and other publications, until she wasforced to flee during the 2009 protests after threats from the Iranian government. 1. Fifteen Minutes: Did you always know you would become a journalist? Nazila Fathi: The first time I fell in love with journalism was when I saw that press conference [in Iran during which Geraldine Brooks was chided by government officials for dressing extremely conservatively]. I realized the power that journalists can indirectly have—the authority, and how politicians could worry about their image in their encounters with reporters. 2. FM: How did you get involved with reporting on Iran for The New York Times? NF: I started as a translator.... [News publications] had a huge appetite for stories from Iran. [As a stringer] basically I was on call all the time. They used me whenever they needed me. I didn’t get any credit, partially because I didn’t have credentials, and The New York Times had this policy until early 2000 that they wouldn’t give credit to stringers. 3. FM: What were some of the challenges that you faced as a reporter? How did you work around them? NF: Part of [my work] was very secretive for one or two years at the beginning, but then things started to change because the government started valuing us because they knew who we were. I was summoned to the Intelligence Ministry and questioned, grilled.... We were showing a more human image of Iran to people. Until then, reporters were coming to Iran, and they were taking pictures of murals of martyrs on the walls, anti-American and anti-Western slogans on the walls, but then through us they started talking to people who expressed very pro-American feelings, and so the stories became much more different. 4. FM: At your talk you spoke mostly about your experience during the 2009 elections. What was one of the more memorable stories you covered before that? NF: The first massive celebration demonstration was over the victory of Iran’s football team [which qualified them] for the 1998 World Cup. That was the first time that people saw that, “Oh my God, we can come out in huge numbers,” and the government was terrified. I mean, even traffic police, they were dancing on the roofs of their cars, throwing their hats in the air. It was just a spontaneous, massive celebration. It was then that people realized that they could appear in public in massive numbers, and the first political demonstrations started in 1999. 5. FM: What was it like for you to cover the 2009 election as an Iranian? NF: I still believe it was the most important event in our recent history, other than the 1979 Revolution. I don’t think anything has shaken the foundation of the Islamic regime as much as those protests. I grew up in Iran, and for 30 years I wanted to see real change in my country. We’re not talking only about political freedom; we’re talking about very basic rights being taken away from people, especially women...as a woman, as someone who has lived in a repressive society, I was dying to see real change. And I was absolutely excited and happy to see those uprisings; I couldn’t believe the government wouldn’t back down. And deep in my heart, I was waiting. I was waiting for the government to back down, even just to hold new elections. That’s all people wanted. But they didn’t, and the violent crackdown started a week after, so it was a combination of joy and excitement first, then a sense of disappointment and betrayal. 6. FM: What was it like to leave Iran? NF: I didn’t know I wouldn’t be able to go back when I was leaving.... I felt like I was betraying my people, that I shouldn’t be leaving. Towards the last three days when my house came under surveillance, I realized that I couldn’t do anything. I didn’t have internet; my phone was tapped; I couldn’t leave my house.... I thought I would leave and things would be completely normal again after a few weeks’ time, and I would come back. I thought the hundreds of people who were arrested would be released after a couple of weeks.... I was writing stories, and we still thought we would go back. It honestly took me about six months to realize we wouldn’t be able to go back. 7. FM: What were you doing during those six months? NF: I went to Canada. We had lived in Canada previously, and it was like a second home for us. I wasn’t thinking of putting my kids in school until a week before September, then I suddenly realized that they had to go to school. People were being gradually released—friends, people I knew—and they kept contacting me and warning me not to go back, [telling me about] the fabricated stories that the government had made up, that I was part of the ring that wanted to overthrow the regime, that I was behind the protests. I realized it didn’t make sense to go back. 8. FM: In Aug. 2010 you came here for the Nieman Fellowship, and now you’re a Shorenstein Fellow. What sort of work have you been doing? NF: The Nieman Fellowship is basically for mid-career journalists.... They give you one year time off from work to take courses here and to expand your intellectual horizon, and usually by the end of the program we all feel we want to do something different. Or, if people go back to their jobs, they have totally new perspectives. I was inspired to write a book, a memoir to tell a bigger story.... The purpose was to use my own experience as a woman who grew up during the first decade of the revolution and then started working as a reporter during the second and third decades to tell a bigger story of what has happened to Iran, to society, and where it’s moving. 9. FM: How has the political situation in Iran changed since Feb. 12, 2010, when the protests died down? NF: The protest continued until February, but before the Feb. 12 protest there was already an internal debate going on among activists and the people who were involved that this was not making sense anymore.... What were they going to achieve? They didn’t want to overthrow the regime because they didn’t have an alternative, the movement didn’t have a clear leadership. The violence was getting out of hand, the number of deaths was escalating, and there was an internal debate—what are we doing out on the streets? I think the movement is very much alive because they still have this internal debate going on.... [The regime knows] that it’s there; it’s simmering beneath the surface. I can’t tell where it’s going, but I’m positive there is a civil society. They’re debating. So this movement is not dead. 10. FM: There are a lot of questions about how the 2012 U.S. election will affect U.S.-Iranian relations. How do you see that relationship evolving depending on whether or not Obama is re-elected? NF: Iran has been one of the most important foreign policy issues, and they’ve said the military option would be on the table if Iran does not back down from its nuclear program. A military option is just catastrophic; it’s mad. And so far I’ve liked Obama’s foreign policy. I think he’s done well in Pakistan and on Iran. He hasn’t had a very active diplomacy; he wasn’t able to bring Iranians to the negotiating table, which is a major setback, but he is trying.... But I think that 2009 also undermined any kind of efforts for rapprochement or even talks about the nuclear program because Obama was faced with a regime that has no legitimacy at home, so how can he engage in any kind of conversation or dialogue? 11. FM: What is it like for journalists still covering issues inside Iran? NF: There are still a couple of people. The Washington Post has a Dutch reporter working for it. But they are doing very little work. You can see the number of stories they’re covering is very limited, and they’re under pressure. I have a friend who works at The Financial Times, who I think is doing the best work, but they’re under huge pressure. They receive threats that they can’t go out on certain days.... Iran is not giving visas to foreign reporters to visit. 12. FM: In 2001, you translated Nobel Laureate Shirin Ebadi’s book, “The History and Documentation of Human Rights in Iran.” What was it like to work with her? NF: Well, she hadn’t won the prize yet, and I had no idea who I was translating. I knew her as a person, but I didn’t know she would become the Nobel Laureate. [She was one of] two very prominent human rights lawyers, both of whom had written lots of books in English, and I would have translated both of their books. Both of them were jailed, and one of them came down with cancer and had to leave the country, so Shirin won. She’s very brave. I think it was a very well-deserved prize, and she has [lived] up to her reputation. FM: They impounded her medal, didn’t they? NF: They did! They stole it! They went into her safe in the bank and they stole it. 13. FM: Your translation of President Ahmadinejad’s statement that “Israel should be wiped off the map” has been pretty controversial. What are your thoughts on the extent to which translation has affected the way he comes across? NF: It might be true that he comes across in a different way in translation, but the truth is that the language he uses is not a very intellectual language. He was elected on a populist agenda, and he constantly wants to appeal to the masses.... He talks in Persian like he’s talking to people who know nothing, who are not aware of anything, and are quite illiterate. Regarding the comment at Columbia, I don’t think he was mistranslated. I think he said what he said. “Israel should be wiped off the map”—this was not his sound bite. This was [Ayatollah Ruhollah] Khomeini’s sound bite in the beginning of the Revolution, and it’s everywhere, on the walls, at the military parades.... The Iranian news agency translated it the same way, before I translated it. Maybe it’s the wrong translation, but this is how it’s officially been going around by the regime itself. It’s not my job to go correct the translation; it’s the government’s job to see how they want to use that slogan. 14. FM: What do you think are some of the biggest misconceptions that Americans have about Iran, and what can we as students do to better understand the country? NF: [There are] three misconceptions. There was no Twitter revolution in 2009. Number two, Iranians did not want to stage a revolution in 2009—it was just a protest demanding second elections to be held. Those demands changed as the violence escalated, but then people very cautiously withdrew from the streets. Number three, a military attack is disastrous for all the countries in the region but most of all for Iranian civil society. 15. FM: Do you have any advice for aspiring journalists? NF: Go out there, learn a language...because you can go out there as freelancers, and then you don’t need translators, you don’t have to rely on fixers, and it’s a big advantage. I saw that in Iraq and Afghanistan—those who spoke the language, they all got jobs with good publications, but the ones who didn’t speak the language, they had to constantly rely on a translator, which is an extra cost.